New CareWipes LCD Wipes protect you and your LCD screens from sweat grime and germs. CareWipes LCD Wipes are pre-moistened wipes with a special formula that cleans valuable fitness equipment LCD screens effectively and safely. These wipes eliminate the destructive moisture exposure that can occur with spray cleaners. Use on any LCD/plasma screen or monitor in your fitness facility. With the growing concern about the environmental effects of discarded plastic water bottles, the new VoyagerTM MVP Hands-Free Water Cooler with Filter Life Indicator from Halsey Taylor® provides an ideal alternative. 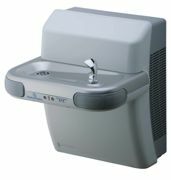 An extension of the popular HTV water cooler family, the new line features an attractive, modern design and is equipped with a proprietary electronic eye sensor and the reliable Aqua SentryTM filter. In addition, the new water cooler features Halsey Taylor's new Filter Life Indicator, which tracks the life of the filter and features an LED display that notifies end users and facility managers when a new filter is needed. CCS ExPress Mobile Bleachers are 10-row bleachers equipped with a self-contained hydraulic actuator, permitting fast, one-person setup in less than 10 minutes. They are high-quality mobile bleachers made of weather-resistant materials and components, so you will never be concerned about corrosion. ExPress Mobile Bleachers are handicap-accessible, DOT-approved for highway transportation and made according to IBC 2000 requirements. Special features include: seating for 160 and 240; increased safety; enclosed raisers; center aisle for easy seat access; full-width floorboard. CCS also offers mobile picnic tables. Competitor Swim Products, a division of Richey Industries, introduced a new product catalog. The brochure outlines all of the product offerings available from Competitor Swim Products, from racing lanes to deck clocks to accessories. With specifications included, the new product brochure will assist customers in choosing the best product for their facility's needs. Steel Bench 169 by DuMor features a new 1/4-inch by 1-inch slotted perforated steel seat and flared armrests along with a contemporary design. Cast-iron supports and stainless-steel fasteners add to the durability of the bench, whether used indoors or out. To help complete your site, Bench 169 also comes with a companion ash urn, receptacle and planter. Choose from 6-foot or 8-foot lengths. CCSI International, manufacturer of ATRIA commercial products, has designed the most advanced commercial structures available for use as shelters, gazebos and shade structures. Color-coated aluminum frames and rafters minimize maintenance. Light-transmitting roof glazing; fire-rated, and opening roof panels for ventilation are available. For larger projects, ATRIA provides wide spans that can be used for pool enclosures. CCSI is proud of its long-term acceptance by architects and builders for the structural integrity and longevity of its structures, as well as outstanding detail in fabrication. Thousands of people have discovered rowing—a great low-impact, full-body workout. Rowing works many muscle groups through a wide range of motion. It's this full-body muscle involvement that makes rowing a great calorie burner and helps users develop flexibility and strength. The Model E Indoor Rower boasts enhanced technological features and a more accessible 20-inch seat height—6 inches higher than Concept2's Model D. A rugged, double-coated frame, rechargeable battery and nickel-plated chain minimize maintenance. The PM4 monitor makes rowing fun with games, wireless heart rate monitoring and racing capabilities. Constructed of 16-gauge steel, Salsbury Industries – Lockers.com's Double Tier Vented lockers effectively combine visibility and maximum airflow with security and are ideal for athletic and other environments. Established in 1936, Salsbury Industries is an industry leader in manufacturing and distributing quality lockers and mailboxes. Products include standard, vented, designer, extra wide, open access, plastic, storage lockers, signage and mailboxes.